Dubai Customs has signed a Memorandum of Understanding (MoU) with the Dubai Free Zone Council to implement the "Guarantee of Virtual Goods Inventory" initiative for companies and customs warehouses licensed in the Dubai Free Zones. 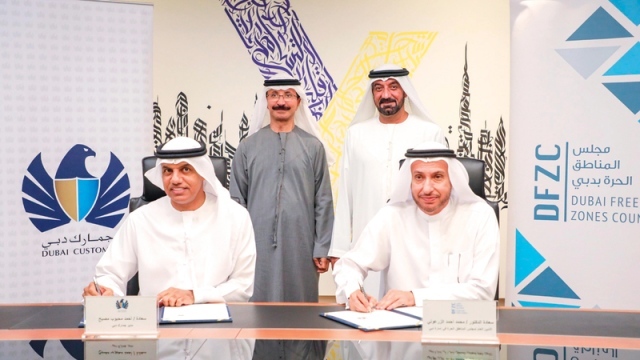 Dubai Customs has signed a Memorandum of Understanding (MoU) with the Dubai Free Zone Council to implement the "Guarantee of Virtual Goods Inventory" initiative for licensed companies and customs warehouses in Dubai's free zones. The initiative comes in line with the directives of His Highness Sheikh Mohammed bin Rashid Al Maktoum, Vice President and Prime Minister of the UAE and Ruler of Dubai, to facilitate business procedures and support trade and reduce the cost. The initiative will benefit 18,000 companies in more than 24 free zones Dubai and 37 customs warehouses, which will be made available to all licensed and operating companies in the free zones, as well as to the customs warehouses companies wishing to use them when re-exporting goods from free zones through the sea and air exit ports of Dubai only and land ports in the country. Under this initiative, which is the first of its kind at the level of customs offices in the world and developed by Dubai Customs, 455 million dirhams will be pumped through the return of customs guarantees to companies and free zone warehouses, which is AED 327 million bank guarantees and AED 128 million cash guarantees. Sheikh Ahmed bin Saeed Al Maktoum, Chairman of the Dubai Free Zones Council, said: "Shortly after the Dubai Free Zone Council began evaluating the mechanisms of mapping the geographical geography of Dubai and implementing the second item of the 50th document announced by His Highness Sheikh Mohammed Bin Rashid Al Maktoum, Vice President and Prime Minister of the UAE and Ruler of Dubai. This agreement, which is the first of its kind in the world, to be implemented by the Dubai Free Zone Council and Dubai Customs, (Document 50) to create the first virtual trade zone Of the kind that will enhance the joint efforts of all economic actors to provide various facilities for the business sectors, attract foreign direct investment, support the local economy of the Emirate of Dubai and enhance its economic position on the global map. "The Dubai Free Zone Council continues to explore the latest trends in the global economy, launch quality economic initiatives that meet investor expectations, support economic growth, create a growth-stimulating environment, competitive business practices in Dubai and the state, and employ state-of-the-art technology. , And digital transformation applications to serve entrepreneurs, start-ups, small and medium enterprises and international companies, from the free zones that have made Dubai an attractive destination for investment locally, regionally and globally. "We are guided by the directives of His Highness Sheikh Mohammed bin Rashid Al Maktoum to develop initiatives and systems that aim to harness all potentials," said Sultan Ahmed Bin Sulayem, Chairman of DP World, Chairman of Dubai Ports, Customs and Free Zone Corporation. To facilitate the operation of investment activities without complications or obstacles, and make Dubai a global station for the establishment of economic opportunities ». He pointed out that the initiative created by Dubai Customs supports free zone companies because of its role in the economy of Dubai. Free zones contributed AED 532 billion, representing 41% of Dubai's non-oil foreign trade for 2018. "Dubai's sustainability is an encouraging and promising environment for investors to contribute to the growth of our business space and the size of our global impact by creating forward-looking services. The first global commodity inventory guarantee system is in line with modern technology and paves the way for Led by Dubai and is firmly in the process of establishing the world's first virtual trade zone, targeting 100,000 companies, in accordance with the third principle of the "Document of the 50th," reinforcing the flow of logistics and technology companies and other sectors. "The agreement establishes the pillars of achieving the third item of the (Document of the fiftieth) to establish the first virtual trade area of ​​its kind». Dubai Customs Director Ahmed Mahbub Musabah said the role of the initiative will not only stimulate the economy but will also drive investors and traders to ease their burdens. Dubai Customs has achieved the highest ratio of 97.5% among Dubai government departments. He pointed out that the return of the value of customs guarantees to free zone companies and warehouses will revive the volume of their operations in Dubai, as it is expected to reuse these amounts in their business activities, ensuring the sustainability of growth and attracting new investments. Dubai Free Zone Council Secretary General Dr. Mohammed Al Zarouni said that the initiative enhances the financial solvency available to companies and business sectors active in the Dubai Free Zones and allows them to reclaim the value of customs guarantees and reinvest them in their projects. Competitiveness by increasing the capital it invests, in parallel with enhancing trade movement at various levels and developing the export sectors of services and goods.